Sleeping under makeshift tarps may never go out of style, but Ruben Martinez thinks there’s room under the stars for a more luxurious version of camping. Martinez is launching the Global Glamping Summit event in Denver on April 24th and 25th for owners—and aspiring owners—of safari tents, yurts and other unique outdoor rentals. “Nothing like this has ever happened in the States, so the fact that it’s happening in Colorado is very exciting,” Martinez said. Martinez founded Glamping Hub, a site similar to Airbnb where guests wanting to forego the typical car camping can book yurts, treehouses and other unique rentals around the globe. U.S. glamper numbers lag compared to Europe. However, on Glamping Hub’s site alone, listings of unique properties grew from 8,000 to 15,000 in between April and September of last year. Martinez expects that number to mushroom to 40,000 listings by this May. Even though glamping makes the outdoors accessible to everyone, the Global Glamping Summit is a little more exclusive. 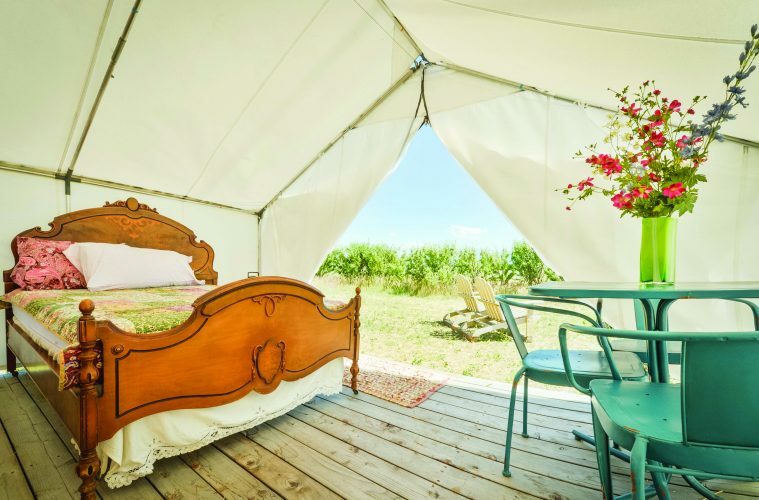 It costs $595, and includes exhibition space, speaker sessions and networking for people already in the glamping business, as well as those ready to break out the tipi rental on their existing property.